For women who are on the go and could use the extra minutes before stepping out, Lakme CC cream is here to the rescue. This cream acts as your everyday mini skin stylist and lets you get that perfect look of makeup + skincare for any occasion. It may be work, party or simply an evening with friends; your personal stylist will help you get the right look for it all. It's time to move on to a simpler regime without comprising on skincare. The Lakme CC cream moistures brighten and freshen your skin while enriching it with a hint of makeup. With sun protection of SPF 30 and makeup benefits like even skin tone and skin coverage, this cream takes complete care of your complexion. The beige variant of this CC cream blends in seamlessly when applied to light to wheatish skin tone. This cream can also be used along with other products or on its own if you prefer just the lightest touch of make-up. This travel pack is compact and easy to carry - which makes it just like taking your mini stylist everywhere. Furthermore, the Lakme CC cream comes in a chic sturdy packaging with a well fitted rose gold cap. Lakme 9 to 5 CC Cream brings you the best of both worlds: It's skincare with a touch of makeup to give you the perfect look, for any occasion, in an instant. Explore the entire range of BB & CC Cream available on Nykaa. 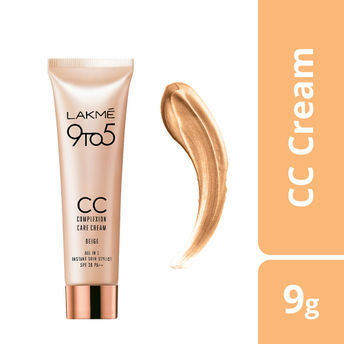 Shop more Lakme products here.You can browse through the complete world of Lakme BB & CC Cream .